The Commodity of Model Making Acu･Stion Acupuncture Takenaka'original goods. the hand, and use by all means. 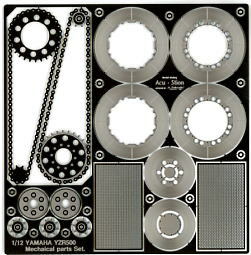 The standard YAMAHA YZF-R1M motorcycle series for TAMIYA company. I will reproduce gimmick & feeling of quality of a real similar car by using the compound material. It served to including the mechanic parts and the decal by the morality price as a set of ..part of the detail.. one. Single purpose sales are prepared. 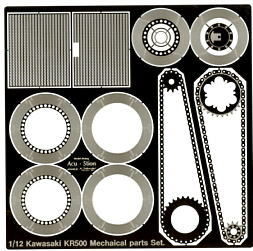 The standard Kawasaki motorcycle series for TAMIYA company. I will reproduce gimmick & feeling of quality of a real similar car by using the compound material. The standard Honda motorcycle series for Hasegawa company. I will reproduce gimmick & feeling of quality of a real similar car by using the compound material. Nogeroccshistem (loose stop) was adopted in the minus bolt set. 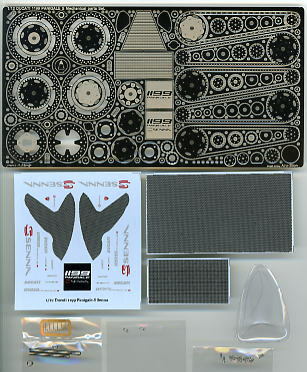 The standard Ducati motorcycle series for TAMIYA company. I will reproduce gimmick & feeling of quality of a real similar car by using the compound material. I will recommend it for A, the Sena specification, and making. 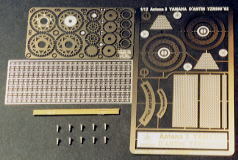 The standard motorcycle series for TAMIYA company. I will reproduce gimmick & feeling of quality of a real similar car by using two kinds of materials. It served to including the mechanic parts and the bolt by the morality price as a set of ..part of the detail.. one. I will recommend it for a thorough making. The part group that cutting is done by * our eminent technology for each company will reproduce the gimmick of a real similar car by the thing installed in the kit. The installed lock pin system is adopted in ATS-9660 1/12 axle *(shaft nut) set by our first technology in the model industry. Cori of tightening the wheel with the lock nut and the lock with the lock pin. Moreover, ATS-9661 1/12 chain *(shaft nut) set that has been omitted is collected in the kit. I will contribute to making of the work of the enhanced full gimmick. ★1/12 Axles & chain *(shaft・nut) full Set. 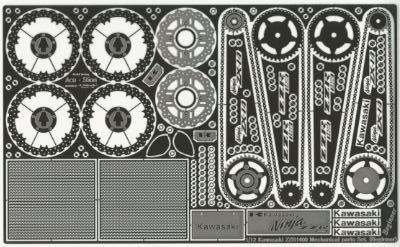 The standard motorcycle series for HASEGAWA company. It served to including the mechanic parts and the chain Gar bolt by the morality price as a set of ..part of the detail.. one. Noge rock Screw (loose stop) was adopted in the minus bolt set. 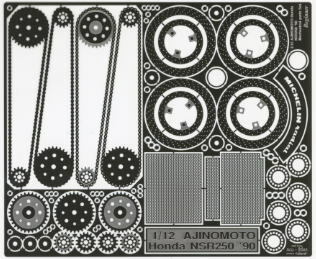 The standard motorcycle series for TAMIYA company. It served to including the mechanic parts and the chain Gar bolt by the morality price as a set of ..part of the detail.. one. 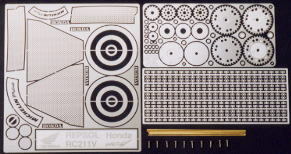 The introductory chapter detail improvement parts of the first modeler. The detail can improve by the thing easily put on Mr. Bikinar. As for content of parts, Intake mesh various disk rotor rotor hub chain Rageetarpanel numberplate nameplate and emblem side-view mirror and etc are collected. A minus bolt is attached to the set. 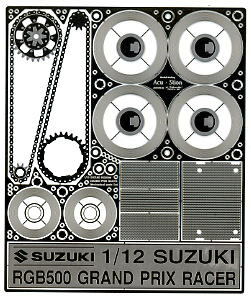 As for content of parts, the disk rotor rotor hub chain numberplate, the refueling entrance, and nameplate engine emblem carburetor ring + carburetor mesh (press parts) are collected. A minus bolt is attached to the Set. 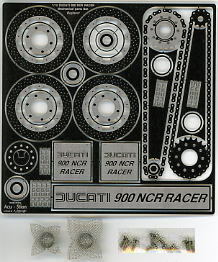 Moreover, of the sisters commodities 1/12 DUCATI 900SS Mechanical parts Set. (Beginner) has been released by this content. As for content of parts, various disk rotor rotor hub chain Rageetarpanel numberplate nameplate and emblem side-view mirror and etc are collected. 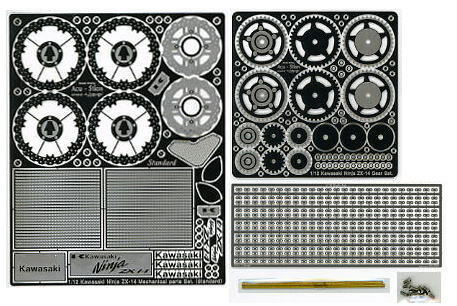 The familiar detail improvement parts in the motorcycle series for TAMIYA company. The detail can improve by the thing easily put on Mr. Bikinar. 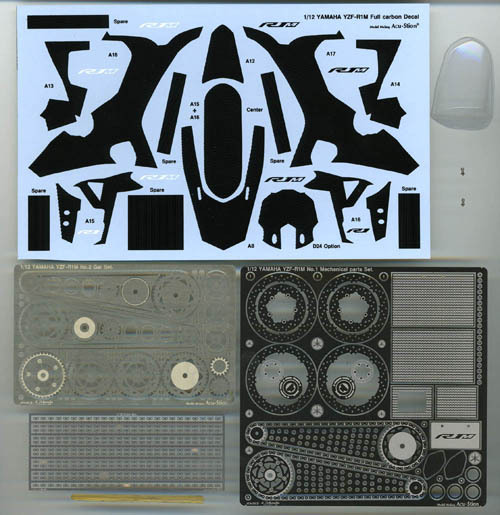 Content of parts is disk rotor Rageetarpanel, is a refueling entrance cap, is various hub nameplates, etc. and is collected. 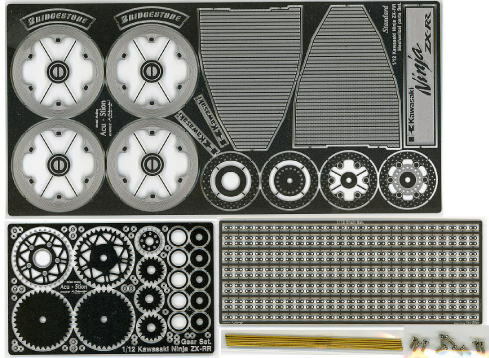 Please use it for the kit of TAMIYA company by all means. 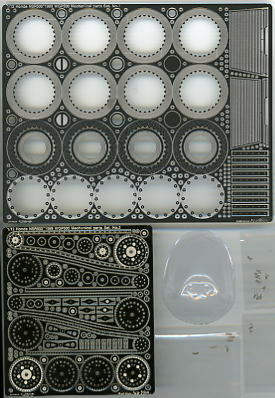 The template series gotten popular let go and joined Sara the template set for the motor cycle. The scale prepared 1/12. If the air brush is done by using Pescon on the market, the logo of the tire can be posted to a real similar car. It can be said to the model production the necessaries item. 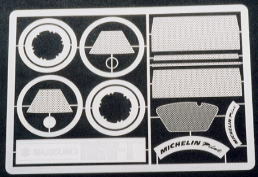 It recommends it for the post of the tire logo of (MICHELIN radiai) as correspondence. The stand set for various motorcycles of a generality type. The main side stand and spring are prepared. It can be said to the motorcycle model necessaries. Please do choice according to the usage and use it. 1/12 Motorcycle Full stand Set. 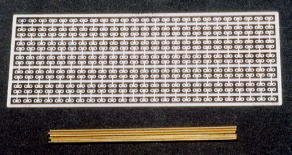 Meter panel set of various each scale of a generality type. Many kinds like the speed meter tachometer, the water temperature meter, the oil pressure meter, the refueling meter, and the voltmeter, etc. of meter panels are collected. Various each Fararcappset of a generality type. If each part are sticked together, itthree-dimensionally reproduces it. Please do choice according to the usage and use it. 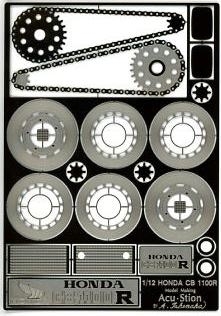 As for content of parts, disk rotor rotor hub chain Oilrageetarpanel numberplate side-view mirror meter rim is collected. A minus bolt is attached to the set. 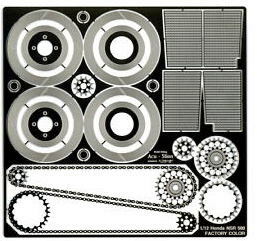 As for content of parts, Rageetarpanel disk rotor rotor hub chain Oilrageetarpanel and various obtaining pins are collected. A minus bolt is attached to the set. As for content of parts, disk rotor rotor hub chain funnel cover numberplate side-view mirror meter rim is collected. A minus bolt is attached to the set. 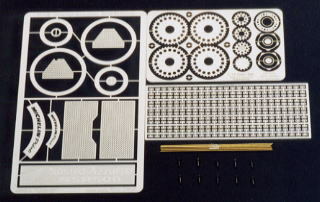 A disk rotor Rageetarpanel mission cover, various Gar, and etc is collected to content of parts. 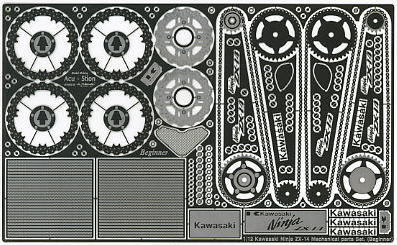 The familiar detail improvement parts in the motorcycle series. The detail can improve by the thing easily put on Mr. Bikinar. 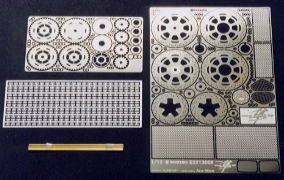 A disk rotor, a refueling entrance, various Gar, and etc is collected to content of parts. 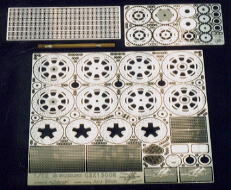 A disk rotor, a refueling entrance, Rageetarpanel, various Gar, and etc is collected to content of parts. Please use it for the kit of TAMITA company by all means. A familiar item joined the motorcycle series. The detail can improve by the thing easily put on Mr. Bikinar. Disk rotor mirror Rageetarpanel, various Gar, various hubs, the refueling entrances, and etc is collected to content of parts. 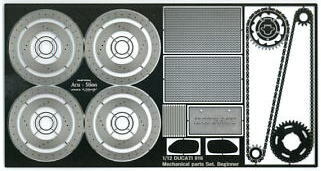 Disk rotor mirror Rageetarpanel, various Gar, various hubs, and etc is collected to content of parts. Disk rotor mirror meter rim Rageetarpanel numberplate brake pedal, various Gar, various hub base plates, and etc is collected to content of parts. Disk rotor mirror meter rim numberplate brake pedal, various Gar base plates, and etc is collected to content of parts. I will recommend a special set for insufficient for the tail improvement of a standard day and Mr. class modeler. If a three-dimensional, real disk rotor is reproduced by one thing a piece piled up, a full set of consent. 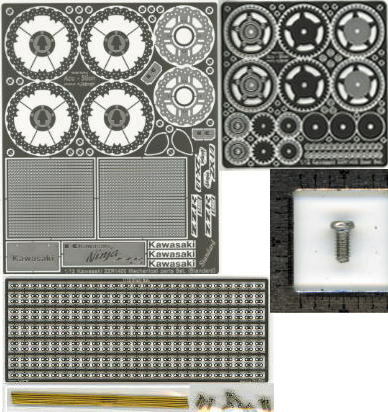 As for content of various etching parts, Rageetarpanel disk rotor oil cap and various obtaining pin chain gears are collected. 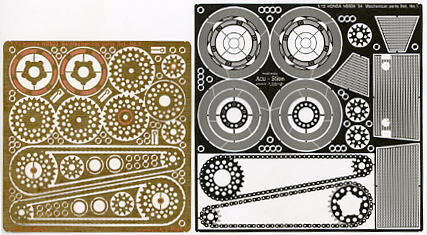 The content of a full set is mechanical parts, Gar, a chain, and a bolt set. Please challenge by all means. Single goods sales and it exists. A full set for Mr. middle modeler. A new item joined the motorcycle series. The detail can improve by the thing easily put on Mr. Bikinar. 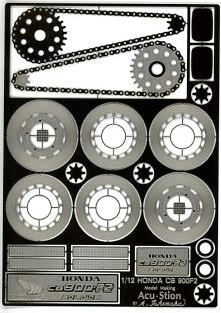 As for content of parts, Rageetarpanel disk rotor chain oil cap and various obtaining pins are collected. A new item joined a standard motorcycle series. 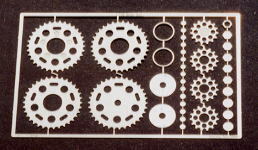 The content of a full set is mechanical parts, Gar, a chain, and a bolt set. Please use it by all means for a standard detail improvement. Single goods sales and it exists. I will recommend a special set for insufficient Mr. modeler for the tail improvement of a standard day. If a three-dimensional, real disk rotor is reproduced by one thing a piece piled up, a full set of consent. I will recommend a thorough making for crowded one. 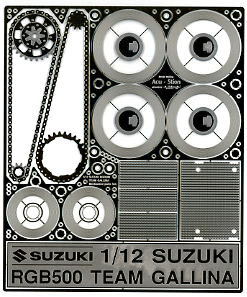 It corresponded to a popular SUZUKI fumble in the domestic production sports motorcycle for TAMIYA company. A special, full set of mechanical parts and Gar & chains. This set is a thing to pile up one piece and to suit the disk rotor and one Gar, and the gimmick is three-dimensionally reproduced. Please use it thoroughly if you reproduce it. A surely convincing final product is sure to finish. There are single goods sales of each part, too. A standard, full set of this commodity of the above-mentioned and the guide. 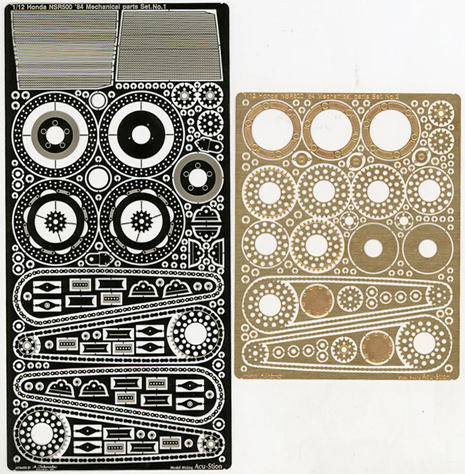 The detail can improve easily only by sticking the mechanical part set together when characterizing. It looks by the small labor, it prospers, and might be the assurance to Mr. modeler who wants to improve it. A full set that is a motorcycle standard series. The content of the set is morality full set of mechanical set Garset chain set bolt. Of course, single goods sales are done. 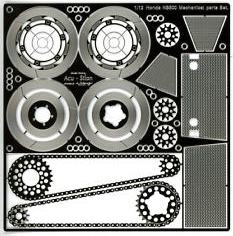 Detail improvement part auto two-wheel series for TAMIYA company. The set of the offer by the value price as for the Garset chain set bolt set including the mechanical part set. Thoroughly, please challenge if you make it. Single goods sales are done. The motorcycle detail improvement set of standard our company. 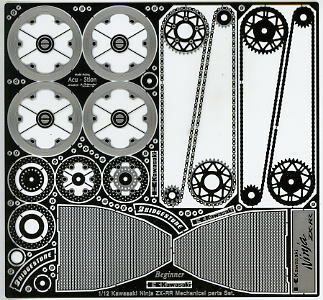 The mechanic part of the motorcycle was made the etching parts and it reproduced it. 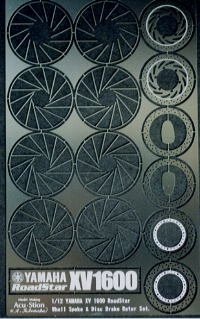 One car etching part set of first our company of the configuration with two-wheel unit. I will reproduce wheel spoke & disk brake rotor for which metallic feeling of quality is the most necessary in the round. Please use it to make the work in there is giving whole mind. Content of parts and reception desk wheel spoke rear wheel spoke reception desk disk brake rotor rear disk brake rotor rear hub side-view mirror Baspurat. 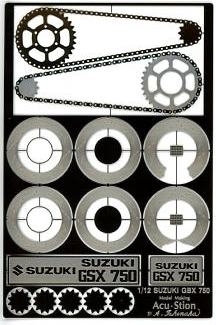 The detail improvement parts corresponding to a long-awaited SUZUKI RGV-γ. 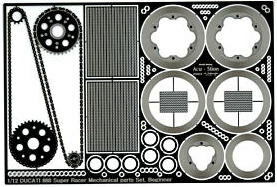 Important parts such as a disk rotors and various Rageetarpanel intake mesh Feirarcapp template base plates were prepared. If this is used, the detail improvement is perfect. 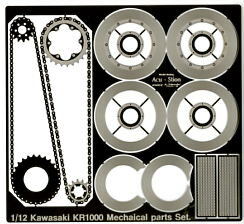 Industry's first 1/6･1/12 chain set. 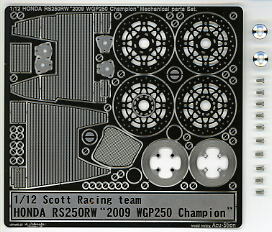 It becomes completion if it assembles it to a real similar car with an etching parts and pipe and pins one by one. It can be said the set to which your arm and perseverance are tested. 1/6･1/12 industry's first Garset. It can enjoy the gimmick of a real similar car if it combines with the chain set of this goods. It can be said the set worth challenging once. The above-mentioned commodity has been released as a set. Because the price is a little and value, I will recommend it. The caul fixation bolt of sea bass RGV-γ of a real car is a minus. It becomes finished of a real similar car if this is installed, and install it by all means, please. 1/12 the 2nd bounce and Nastro Azzurro succeeded to TAMIYA company. 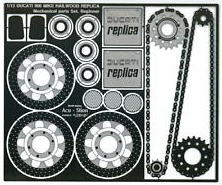 The reproduction of parts of the detail is started with the detail improvement parts for Ro, and the set that the two wheels modeler such as movable chains is done in. A splendid set that tests your skill. 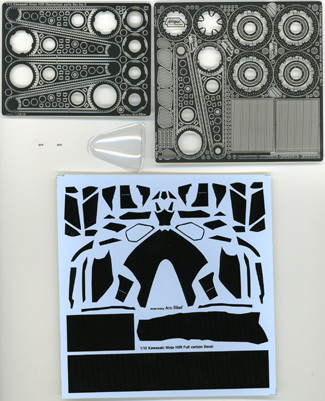 Kawasaki, it is Ninja ZX-12R for TAMIYA company, and the day set of the tail improvement etching parts. The content of the baht improves the exterior and the interior in the grade further by the mechanical part set. 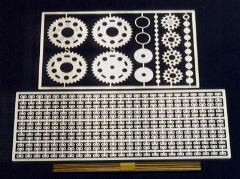 Moreover, this full set includes the developed Gar & chain set by original our company. Please use it by all means if you enjoy the gimmick of a real similar car. It will update every month because there are too a lot of commodities and link, please. Please claim General Catalogue want to learn all information.